Note: this bike sold on eBay in 2007 for $405 plus $100 shipping. I have decided to sell my Singlespeed Nishiki Cyclocross bike. This bike is one of a kind. Nishiki never intended this bike to be a cross bike, it started its life as a Nishiki Sport. I soon realized that this bike had more tire clearance than my... Specialized M4 2001 cross bike. The Nishiki frame is made with 4130, the same steel used on Surly bikes. I had a frame builder braze on the rear cantilever brake mounts. Next, I bought a steel Surly cyclocross fork that matched the original fork identically in styling, except it had way more clearance and canti posts already on it. Next I had the frame powder coated, its called Dahlia Yellow (RAL 1033, powdercoating code). The powdercoating was done by Sycip. Then came the fun part of building the bike up. It has a silver 1" Chris King Headset, Dura Ace 7400 cranks, Crank Brothers Candy SL pedals, Selle italia white saddle, Empella Frogglegg cantilever brakes and Cinelli Grammo titanium stem. The wheels are Campagnolo Victory Crono tubular rims on Specialized hubs with Tufo Tubular Elite 32mm tires. These tires have been raced once. The current gearing is 39x20. With the current chain you can run anything from 39x17 to 39x20 with the same chain. If you wanted to get a flip flop wheel, you could run it fixed. Fixed cross is a crazy thing, something I'm not strong enough to try, but it could be done on this bike, if you were so inclined. There is no derailleur mount, so this bike has to be fixed or singlespeed. Although, you could put on a front derailleur and run two or three chain rings up front and have a 3 speed. I had two custom decals made up for this bike, the downtube "Nishiki" looks sweet in blue and the decals are over the powdercoat, so you could remove them if you wanted. The decals are in awesome shape and are not cracking or peeling from the frame. The bike as pictured weighs 20.75 pounds on my digital Ultimate bike scale. The bike was raced by me for one season last year up here in Portland Cross Crusade series. I like to think it has been race proven. Not that I did very well on it, but thats on account of lack of training and skills, not because the bike didnt handle the way it should. This bike is bomber and can handle a lot. Some of the details: The Dura Ace cranks have been accented blue, blue crank bolts and blue pedals go right along with the blue Nishiki custom decals. Also, the white saddle and matching white brake cables are a nice touch. The bike has that retro feel to it, but also a very custom look. I got many compliments from complete strangers at cross races on how cool this bike looked. Many commented, "I didnt know Nishiki made a cross bike." They didnt. The bike looks even better in person that the pictures show. So whats wrong with it? There is a ding in the seat tube about 6 inchs from the BB, shown in a picture taken. This was here when I bought the frame, and it has not gotten worse, and I have ridden this thing as hard as I could and it has not affected the performance of the ride. It is purely cosmetic, being that this is a steel bike. If it was aluminum, that'd be a different story. One other point, is that the rear wheel is out of true and will need to be trued. I dont feel like doing it sorry. 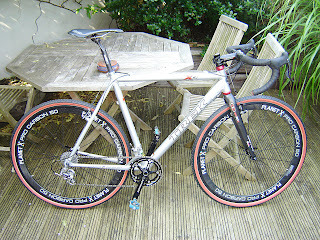 "Here is my cross bike for racing here in England this autumn. It weighs right on 17 pounds as it sits with pedals and all. I have been commuting on it for a few weeks with a different wheelset and it is a great bike! It will be doing it's first race this weekend." If you want any more details, just let me know. If you have a sub 18 pound cyclocross bike or a handmade cyclocross bike, email it to me at plusonelap at gmail dot com. The first Sram grouped cyclocross bike to the Plus One Lap galleries. Thanks for the pics and info Terry. match the excellent riding bike by the end of Cross season." If you have a sub 18 pound cyclocross bike, or a cyclocross from a handmade builder, email it to me at plusonelap at gmail dot com. Just a little video to get you extra pumped about the season quickly approaching.